Tie Rack is to be shelved. Buy yourself a black number to mark the occasion. Once there was a branch of Tie Rack in every High Street, station and airport, selling every possible pattern and permutation of neckwear - stripes, polka dots, plain, and not forgetting comedy ties (oh, how we laughed - the very idea of a Snoopy pattern on formal wear). Most of the shops were no bigger than a walk-in wardrobe, and in each one the customer was dazzled by that slightly-too-bright silk-and-polyester mix, like a TV with the colours turned up too high. Until Tie Rack, ties had been either something your grandad wore every day of his life for no clear reason, or thin black things bought during the Two-Tone craze. The wider and brighter ties sold in Tie Rack reflected the progression of the 1980s, where everybody wanted - or was told they wanted - to get rich. It went like this: How do you get rich? You get a job in the City. And how do you get a job in the City? You buy a TIE! 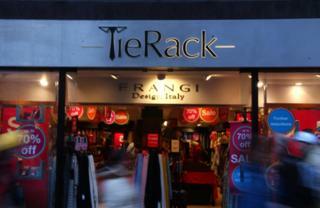 In a way, Tie Rack was selling the dream of the 1980s. You may not have been working for a merchant bank, shouting into a mobile phone the size of a breeze block, and making a million before lunch (which you didn't eat because it was for wimps), but Tie Rack made it possible - and affordable - to have that little something in common with Gordon Gekko, even if you were a lowly insurance salesman in Prestatyn or a junior office clerk in Keighley. The positioning of Tie Rack outlets was key in this - they were in train stations and airports because they were for people who were just too darn busy to go to the shops. The same principle applied to its rival Sock Shop (the Spandau Ballet to Tie Rack's Duran Duran). But whatever today's go-getters want to go get, it's not neckwear. When even Conservative prime ministers go open-necked, you know that a small sartorial legacy of 1980s Britain has gone for good. Add your tributes using the form on the right.